From despoiling an exhibit at the Natural History Museum to provoking the ire of her first boss to sticking the cops on her mysterious neighbor, Crosley can do no right despite the best of intentions --or perhaps because of them. Together, these essays create a startlingly funny and revealing portrait of a complex and utterly recognizable character who aims for the stars but hits the ceiling, and the inimitable city that has helped shape who she is. 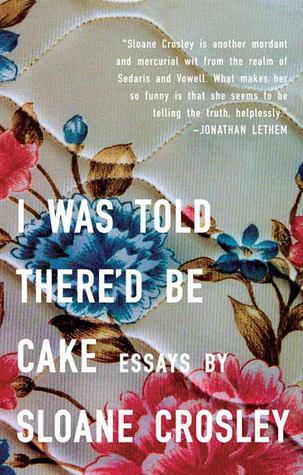 I Was Told There'd Be Cake introduces a strikingly original voice, chronicling the struggles and unexpected beauty of modern urban life. Picked this one up after reading an article about audiobooks for podcast listeners. Since I'm a fan of both of those things (along with essayists and memoirs), I thought I'd give it a whirl. But what I discovered is that this type of book only works for me when I'm familiar with the author before starting. I watched Mind Kaling on The Office and The Mindy Project, I read Jennifer Lawson's blog, I followed Anna Kendrick on twitter - I had a semblance of who these people were, but before picking up I Was Told There'd Be Cake (great title, by the way), I had never heard of Sloane Crosley. Crosley is funny, poignant, and secure enough to share some humiliating moments. She is relatable, seemingly sincere, and offers a modern understanding of a young woman in the big city. I enjoyed both her voice and her stories, but I just didn't have as much fun listening. I didn't connect because I didn't have a person to connect to, so I've decided to do some investigating, some responsible research, and then tackle another of her books to see how it goes. Any suggestions on other audiobooks for podcast listeners? A review of The Princess Diarist to come soon which subsequently finishes off my planned essayist/memoir titles for the year.